“I can’t believe it. We had been in the position to have won a couple of races here at Murray Bridge over the last couple years only to have something go wrong. I can’t thank my guys enough, with about five laps to go the car just took off. I had one change to get by Robbie and I took it” added Egel following his win in “The Murray Valley Standard” supported event. The win was Egel’s first at Murray Bridge driving for Mike and Darryl Downing. Farr, who had started from the pole after winning the top 8 Pole Shuffle, had led all of the previous 29 laps and was understandably dejected following the race. “We didn’t really do anything wrong all night, but the lapped cars gave the guys behind me a chance and Matt took it”. Third place went to current points leader Luke Dillon, who now has three podium results in the three completed Shadetec USC SA rounds. Fourth place went to Mount Gambier’s Steven Lines, who was unlucky not to make the podium after challenging for the lead with three laps to go with Daniel Pestka completing the top 5 only 1.77 seconds behind the race winner! Victorian Jack Lee, who was impressive all evening, finished sixth with Keke Falland, Daniel Evans, Brad Keller, who won the B-Main, and Steven Caruso completed the top 10. The caution light only came out once throughout the 30-lap finale therefore the leaders were constantly in traffic keeping the leading drivers bunched up and trading positions on the multi-laned race track. With such a clean race there were only two retirements with the first being Ryan Jones with a fuel line issue and James McFadden, who sustained a flat right rear after hitting the turn two wall as he battled with Egel for fifth position. Heat winners on the night were Jack Lee, James McFadden, Robbie Farr, Daniel Evans, Ricky Maiolo, Daniel Pestka, Steven Caruso and Ryan Jones. 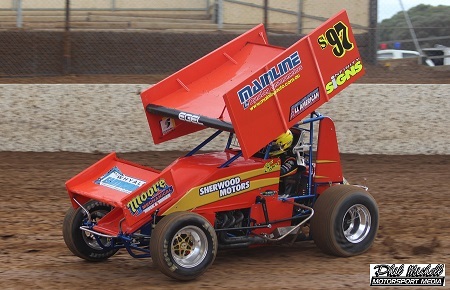 The heats ran without too many incidents until the final two heats when Adrian Cottrell rolled in turn two after driving colliding with Brad Keller while Tasmanian Tim Hutchins put his car on his side in heat 8 after contact in turn two. Darwin’s Jamie O’Neill rode out the biggest incident of the night after hitting the wall in the B-Main with the contact ripping the tail tank from the chassis.